Whether topping off a crispy pizza, fresh spring greens, or more, these medium-sized black olives are sure to please. Conveniently pre-pitted and preserved in a generously-sized #10 can, these olives ensure you'll be in good supply for your patrons, and the ease of preparation will allow for fantastic service. 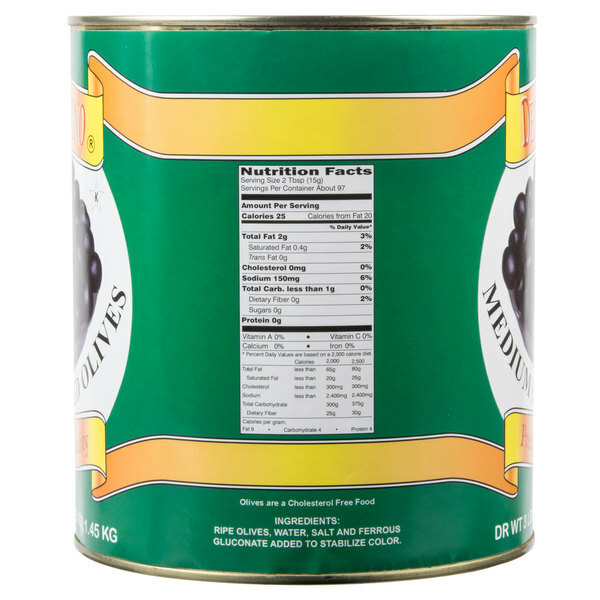 Black olives are firm in texture, sweeter and nuttier in comparison to green olives. Serve them alone as part of a rich and flavorful olive bar or blend them up as part of tangy and sweet vinaigrettes or tapenades. Medium black olives are popular on a variety of items, including sandwiches, salads, and pasta salads. Serve atop flatbread or with penne pasta primavera. Black olives taste great when paired with sundried tomatoes, roasted red peppers, artichokes, feta cheese, and more. Whichever way you decide to incorporate these medium black olives in your signature dishes, they're sure to be a favorite at your salad bar, Italian or Greek restaurant, or cafe. Regal Bay Seafood Blend - 7 lb. Hands down the best tasting high quality black olives I've found. These were a huge success and there were plenty to go around ad yet no leftovers! Firm and succulent with the freshest taste! These medium pitted black olives are really good value. We use them for Greek salads and for taco bars. The quality has always been exceptional. I love these olives. They have a great flavor and not too salty like some other brands. Been through 4 cans now without even a partial pit. I highly recommend these black olives. A top quality olive that is great for our antipasti trays and olive bar. The pitted black olives are yummy and make a great addition to our house salads. These are good medium pitted black olives. They are slightly mushy in texture but that in understandable as they are canned and very ripe so they should be somewhat soft. They are very salty but can be soaked in water for a couple hours to remove some of the brine. They have a full flavor and are great with salads or as a side! Will definitely purchase these again and again. Solid texture and great flavor. Better than Lindsay olives and much more to add to you dishes and salads. 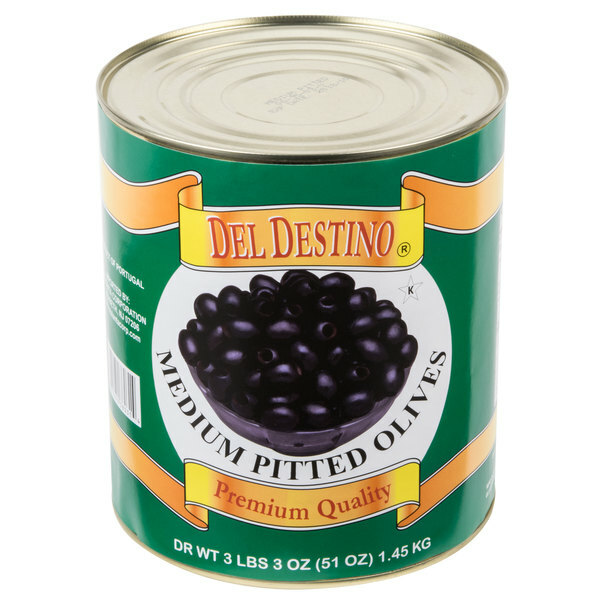 A very tasty pitted black olive that come in a great number ten can and at a great price. The pitted olives make a nice addition and add color to our antipasti trays for our catering events. .
Great medium pitted black olives. I love snacking on olives as well as using them in a lot of my dishes. The price is amazing and they taste great. Fast shipping as always. 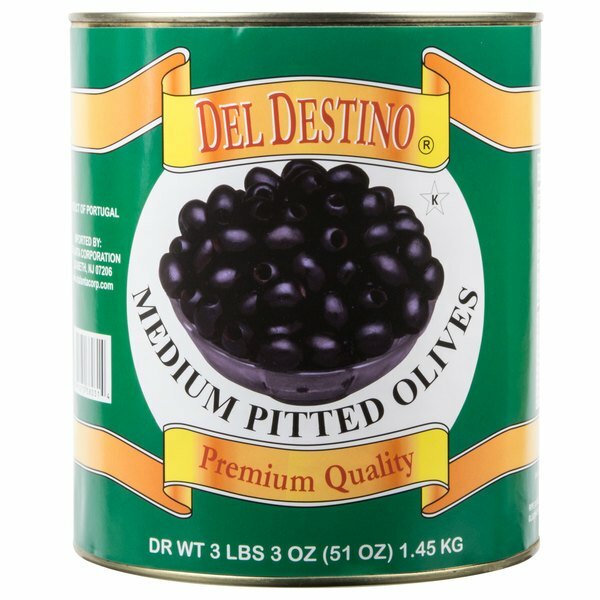 Sir Clean recommended this product #10 Can Medium Pitted Black Olives - 6/Case for the quality and price, it's perfect to use in restaurant, home etc. Really fresh! These black olives were really tasty. They really helped me snack healthier as part of a salad or by themselves. 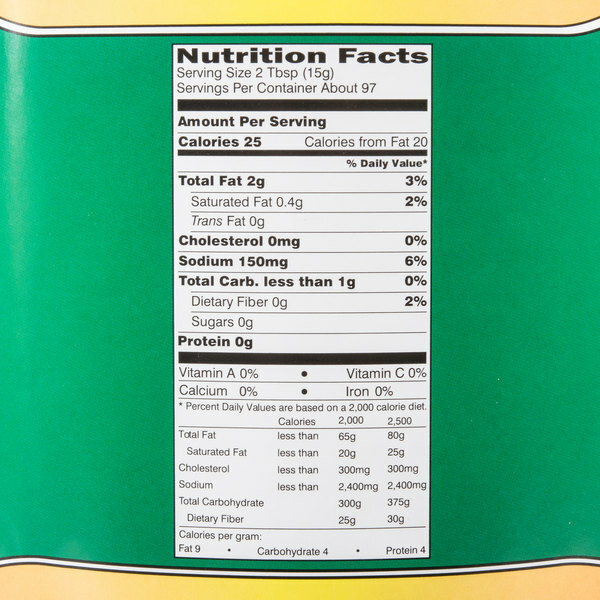 There really aren't any harmful ingredients in these olives either. These are your average pitted black olives. They are no better or worse than super market ones. They are good in salads and much more. The black olives are pretty good, full body and meaty. We really like the ones from Spain but even the Egyptian ones are good quality. These are a premium tasting black olive. We started asking if they would like to try black olives on their salad and started with just a few per serving. We have been asked for seconds so know they are popular. I think the contrast they give against the colors of our salads is very pleasant. I never thought after all these years I would be buying this # 10 can of PITTED BLACK OLIVES. When I seen the can I was totally lost until my retired master chef husband said he is making today HUMMUS WITH CHOPPED BLACK OLIVES and other herbs.He said he will know there is no added items that I cannot eat. And this is one fabulous snack, fresh and you made it yourself. Your family and friends will be amazed you did this. Just serve with different types of chips that is also sold right here on WEB.COM. We use a large quantity of these olives and find them to be very consistent order after order. 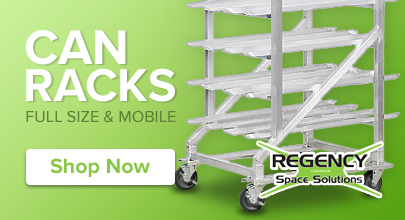 The medium size is true to the description and meets our needs. We recommend. These pitted black olives have a great flavor and work well in a variety of recipes. They are easy to slice, if you need them sliced. The case is a more economical choice, and the cans store easily. Great value! Product was good for the need of it. We used these for a condiment in a salad for a church dinner and everyone responded well with the product..would order again! GHreat price for a good product! Having pitted whole black olives is great for use either as a whole or even slicing and then placing on different dishes. The price is best part in my opinion as I can't find a better price any where else! These are great just as they are. The brine is really very nice. Its a nice product with a nice price to go along with it. I find the #10 can a good value for the whole pitted olives. I use the pitted olives a lot so it makes sense to me to use the size #10 can for the volume and savings purposes. These olives are of good quality and most of them are uniform. Size #10 can saves money and time (rather than to open multiple small cans) for me.